Handbrake Won't rip DVD to MP4 But M4V Format, Resolved! Certainly, discussion about Handbrake rip DVD issues never stops. While you are complaining about Handbrake cannot read DVD, some people are beefing about the MP4/M4V option in Handbrake like the cases below. I'm using the latest version of Handbrake on the Mac. When I rip a DVD, handbrake shows that it will rip DVD to mp4 format. However, when the rip is complete, the file format is m4v. How can I make sure that the file is ripped to the mp4 format not M4V using Handbrake? Hi everyone, I was curious if there was a possibility to change handbrake's default .m4v container to a regular .mp4 container? Because some .m4v files don't like to work on some of my consoles. At some point Handbrake DVD decoder users found there were constant DVD video playback issues as Handbrake rips new DVD movies to M4V format, not MP4. A typical problem is that QuickTime as well as some other consoles like Android reports an error when playing the encoded file. To address this problem, we've listed the difference and solutions about M4V vs MP4 for saving ripped DVD to MP4 instead of M4V in Handbrake. M4V is a container format developed by Apple and is very similar to the MP4 format. Files saved in .m4v are open in iTunes by default and come with DRM copyright protection to prohibit the access (especially from competitors like Android) for commercial use. So you have to remove iTunes DRM from M4V video for easy playback on Android based devices. Compared with M4V, MP4 has no copy protection restriction and is compatible with almost all media players. That's why people prefer MP4 to M4V when Handbrake Mac rips DVD. Like the cases above, Handbrake (Since version 0.9.5) saves DVD and video as M4V rather than familiar MP4. Why? Generally, Handbrake stores audio in the AAC format, which possibly passes through AC3 audio from a DVD in an MP4 file. For MP4 files, Handbrake will automatically use the M4V extension if your output contains AC3 audio, SRT subtitles or chapter markers. The reason for this is that QuickTime or any QT based apps will refuse to play a MP4 file with these features enabled, unless the extension is .m4v. Despite Handbrake mentions that there are no differences between MP4 and M4V and there is an option in HandBrakes preferences to select the extension, it's recommended not to change M4V to MP4 in Handbrake if containing AC3 audio as it therefore won't be played on QuickTime. For users who plan to use Handbrake to rip DVD to MP4, they might feel quite unpleasant. Since it makes no sense to change the file extension in Handbrake from M4V to MP4 back and forth, you can simply convert M4V to MP4, AVI, MOV, WMV, MKV, FLV, etc with the help of a video converter. 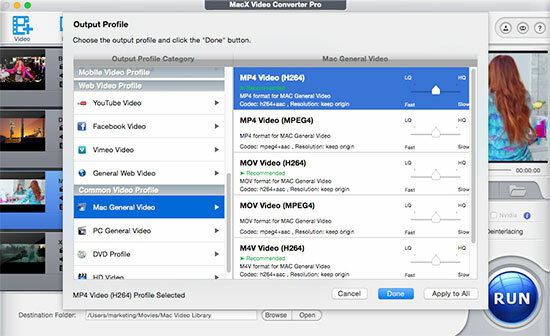 And MacX Video Converter Pro proves to be the ultimate Handbrake alternative with stunning M4V to MP4 video converting ability as well as other exciting features, letting you not only convert M4V to MP4, AVI and other formats but also directly transcode M4V to be Android, Microsoft and Google compatible formats with no quality loss. If codec setting is a headache for you in Handbrake M4V to MP4, you can simply resort to a Handbrake alternative that deals with DVD to MP4 conversion quite well. 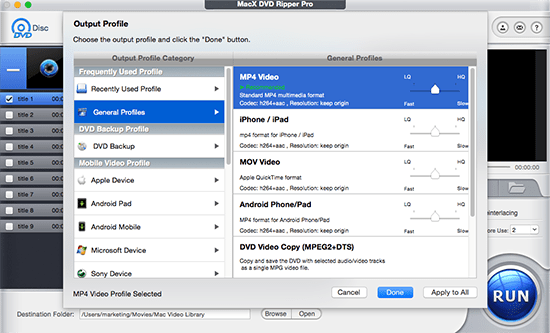 Fortunately, MacX DVD Ripper Pro happens to the best Handbrake alternative that is versed in ripping both homemade and commercial DVDs to MP4, H.264, MPEG4, M4V, MOV, AVI, WMV, etc. It also allows you to directly rip copy protected DVD to Apple iPhone XS/XR/X/8/7/7 Plus/6S/6/6 Plus, iPad Air, iPad Mini 4, Samsung Galaxy Note 9/Note Edge, PS4, WP8, and so on with 5X faster conversion speed. After ripping DVD with Handbrake for Mac, you can take advantage of MacX MediaTrans to transfer videos from computer to iPhone iPad iPod for playback on the move. And this iPhone file manager also provides you the easiest solution to manage files on iDevcies including music, eBooks, photos and more. In fact, except for the incorrect output format, there are many other not working issues when using Handbrake to rip DVDs, for example, Handbrake not ripping full DVD movie, can't rip DVD to AVI, libdvdcss.dll not working, no title found, video/audio out-sync, no valid source found, DVD reading error, etc. And, the former functional DVD ripper provides you an once-and-for-all solution to rip any DVDs without error. Learn how to convert video with HandBrake 1.0.0 on Mac/Win/Ubuntu simply, like MKV to MP4, VOB to MP4 using HandBrake with high quality, fast video to VP9 encoding without crashes. Handbrake copy protection removal guide - learn how to solve Handbrake can't copy protected DVD with the help of Libdvdcss and copy protected DVD using Handbrake without errors. Rip and Import DVD to iPad - Handbrake Be Helpful or Helpless? To copy and import a DVD to iPad using Handbrake is a great choice, for Handbrake is a free open source DVD ripper to rip DVD to iPad iPhone with MP4 format on both Windows and Mac platforms. Yet, to rip protected DVDs to iPad, can Handbrake render you help? MacX DVD Ripper Pro is the best Handbrake alternative which can freely backup any DVD disc, ISO image, DVD folder on Mac (MacBook Air/Pro, iMac etc) in 1:1 quality to various video formats (MP4, MOV, MKV, AVI, FLV, etc) and portable devices with original quality.